Jan wanted “roasties” for dinner. I had thought that Eilene was going to eat out with her friends. Two hours before dinner, she announced that she was bringing two friends over for dinner. Roasties for two had suddenly become dinner for five. Time to get creative. We visited New Zealand several years ago and the thing we miss most—besides everything—is kumara. In NZ roasted root vegetables were called “roasties” and they usually included kumara, a small fingerling “potato.” This is not the same plant as the sweet potato, sometimes also called a kumara in other parts of the world. Sadly for us kumara are not readily available outside of NZ and the Andes. I have to make do with the tubers we have. You can really use any root vegetable, but for this meal I chose some baby Dutch potatoes, a red potato, some fingerling potatoes, a yam, and a sweet potato. For vegetables, I added an Yellowstone carrot, some Brussels sprouts, and of course some sweet onion. To feed the extra mouths, I decided to add some chicken to the roasties as well. 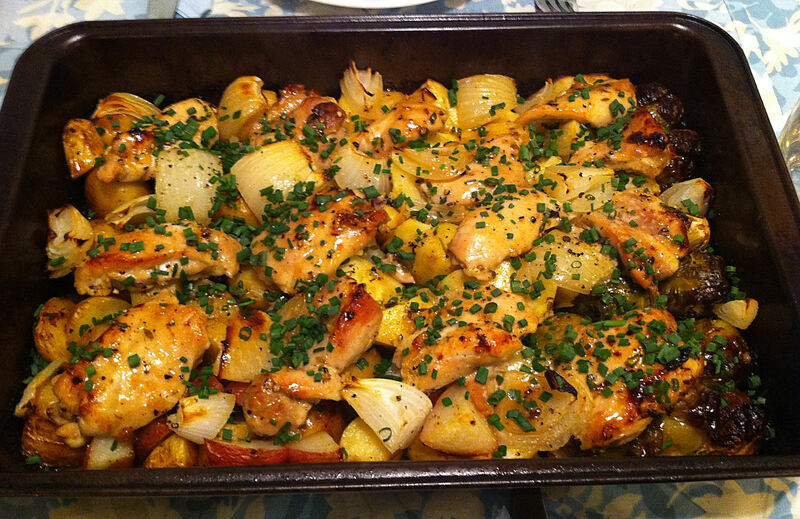 However, looking on-line for roasted chicken and potatoes recipes, they all seemed overly complex. Boiling the potatoes first and frying the chicken, before roasting them together. This seemed to me to require too many pots and steps, there had to be a simpler way. The trick is to add the ingredients to the pan in stages. First start with the slow cooking potatoes. Then add the vegetables. Finally, add the chicken. By the time you add the chicken the potatoes will have already formed crispy crust. To add flavor to my roasties, I decided on an oil, lemon and herb sauce. I wanted to add some honey for the sweetness, but if I added to the initial sauce it would burn in the hot oven. Tender potatoes with a burnt crust did not sound appealing. I decided to add the honey to a final basting of the sauce near the end of the roasting time. 2. Mix the sauce ingredients in a medium bowl. 3. Toss the potatoes in the sauce and place them in a Pam-ed 2 inch deep baking pan. Tip: Shake the potatoes slightly, so you do not use up too much of the sauce. 4. Put the pan in the oven and roast for 15 minutes. 5. Toss the Brussels sprouts and carrots in the sauce. 6. Turn the potatoes in the pan over and push them to one side. Add the Brussels sprouts and carrots and continue roasting for 15 minutes. 7. Toss the onions and chicken in the sauce. 8. Turn the Brussels sprouts and carrots over and stir the potatoes in the pan. Tip: Make sure that none of the vegetables are sticking to the pan. Shake some of the sauce off of the chicken and vegetables, you want about two tablespoons of sauce left, Add some more olive oil if necessary. 9. Scatter the onions and chicken evenly over the other vegetables and continue roasting for 15 minutes. 10. Mix the honey into the remaining sauce. 11. Brush the remaining sauce liberally over the chicken and switch the heating element to broil. 12. Broil the roasties for five minutes, until the chicken is cooked through and well browned, but not burnt. 13. Transfer the roasties to a serving bowl or serve right from the pan. Garnish with the chives.